Last night, we journeyed to the 'hood to see The Donnas at Safari Sam's. You might think that this post title refers to the girls (and, yes, they are hot), but really I'm describing Safari Sam's utter lack of air conditioning. We might as well have been in robes in a sauna, but, instead of being in a luxurious wood-planked spa unit, we were in a dank and dingy club. I was melting like the Wicked Witch of the West, just standing still. Truly awful. Nevertheless, it's difficult for me to say anything bad about a concert by The Donnas. Why? Bedraggled and dripping with sweat, I let out the most enthusiastic cheer I could muster when the girls finally took the stage. The crowd was dynamic and totally into the music. You could tell they were true Donnas fans, mouthing the words to nearly every song. I say "nearly every" because The Donnas debuted three new tracks, which Mr. Monkey and I had the pleasure of hearing (along with the preliminary cut of the new album) last weekend when we, my brother, and his girlfriend had dinner with Mama Monkey. Good stuff. Of particular note was the abundance of pint-sized patrons at this concert, whom Brett (the lead singer, who rocked a most awesome pair of skintight zebra pants) warmly welcomed between songs. There were at least a dozen kids ranging from age eight to the early teens -- cute crowd-surfers, small stage-divers, and mini-moshers, if you will. Their parents were your typical Silver Lake types, purportedly leading the alternative lifestyle with their pink hair and hemp bags. For the record, I saw them all get out of various Volvo, BMW, and Lexus SUVs. Poseurs! The Donnas' new album is slated to be released in September. They recently formed their own label and graced the cover of the June 30 issue of Billboard. You can read more about it here. 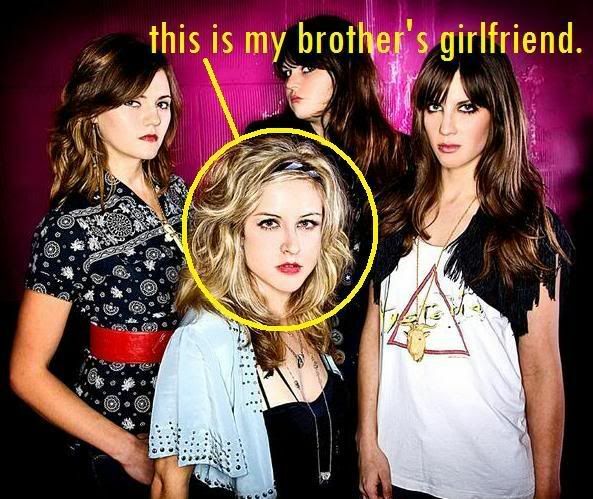 i love the donnas. those girls can seriously rock, and i love that. we need more girl rockers. 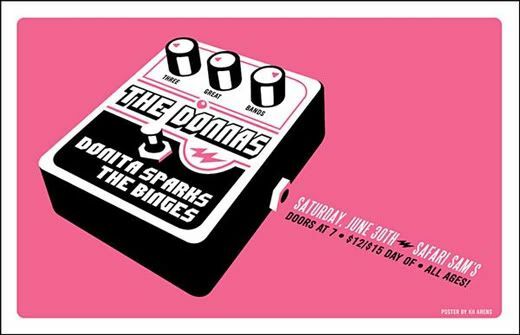 The Donnas rock! That post immediately made me think about '10 Things I Hate about you'.. I think Julia Stiles aka Cat mentions them. How's that random thought for a Sunday! wow! you mean i wouldn't have gotten the "what are you doing out with your kid after 11 on sunset? you're a horrible mom!" looks after all? dammit. it sounds like it was fun as hell. Sounds like fun...except for the being hot and sweaty part. Ick. But you're a trooper for hanging in there!